(from l to r) Edith Bouvier Beale (Mary Gibboney) and her daughter, “Little” Edie Beale (Heather Orth) end their lives living in squalor in ‘Grey Gardens: The Musical.’ Photo Credit: Jay Yamada. Enthusiastic fans of the cult classic documentary film, “Grey Gardens,” have eagerly awaited the San Francisco premiere of the Broadway musical it inspired. CustomMade’s production, under the capable direction of Stuart Bousel and musical director David Aaron Brown does not disappoint. The tale of “Little Edie” Bouvier Beale is an American tragedy, or a celebration of flamboyant individualism, depending on how you look at it. Perhaps it is both. The daughter of “Big Edie” Ewing Bouvier and a cousin of first lady Jacqueline Bouvier Kennedy, Little Edie grew up in the lap of luxury. But after her parents divorce, she and her mother gradually sank into poverty and ultimately squalor, perhaps partially as a result of mental illness manifested as hoarding. By the mid ’60s, the two women lived in isolation with more than a dozen cats in their 28-room East Hampton mansion, “Grey Gardens.” When their condition became public knowledge, Jacqueline Bouvier Kennedy intervened, spending the necessary money (over $30,000) to clean and restore the house. A thousand bags of garbage were removed. The story was given new life by an Academy Award winning documentary and later a feature film starring Drew Barrymore and Jessica Lange. Little Edie, who, like her mother, always saw herself as a misunderstood artiste, attempted to capitalize on her celebrity by launching a cabaret career, but the NY Times critics described her act as “a public display of ineptitude.” It is not surprising that this story has found cult status. It seems inevitable that someone would write a musical and someone did. ‘Grey Gardens: The Musical’ premiered Off Broadway at Playwrights’ Horizons in New York, in February of 2006. It made it to Broadway less than a year later, where it garnered 10 Tony nominations and ran for over 300 performances. And now, thanks to CustomMade Theatre Company, we can see it in San Francisco. Stuart Bousel’s staging (his first musical, and, hopefully, not his last) benefits from his usual excellent stage pictures and psychological insight. Although the first act was a bit shaky on opening night, by the time the finale was reached, the cast had earned an enthusiastic and well-deserved ovation. In the first act, Heather Orth plays the mother (Big Edie), while Juliana Lustenader is the young Little Edie. Both do well. But the story really comes into its own in the second act, when Orth plays Little Edie in middle age, and the wonderful Mary Gibboney plays her mother. Both women are simultaneously heart breaking and funny, and the depiction of their gothic nightmare is chilling, bizarre and wildly entertaining. 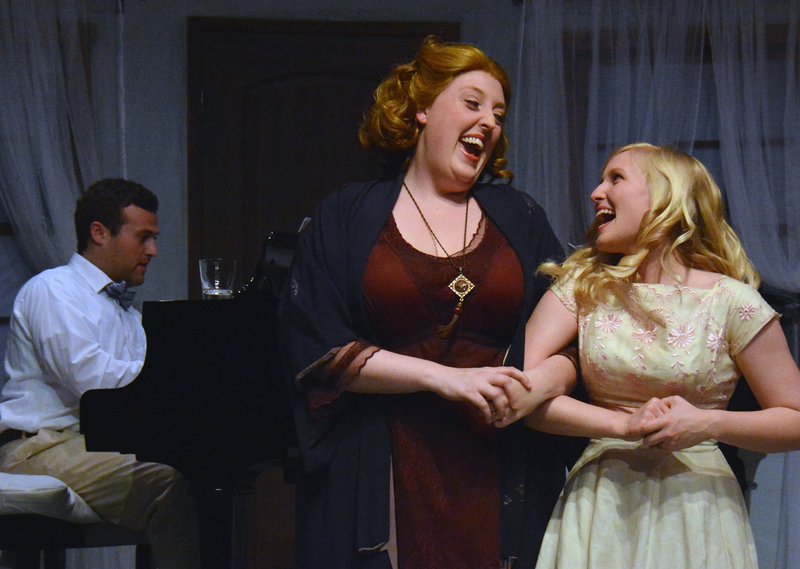 “Big” Edie (Heather Orth) and “Little” Edie (Juliana Lustenader), happy before their decline, accompanied at the piano by George Gould Strong (David Aaron Brown). Photo Credit: Jay Yamada. The excellent score is directed well by David Aaron Brown, who is not only the musical director and sole instrumentalist, but appears onstage (at the piano) as Big Edie’s pet accompanist and paid companion. He is excellent in both roles. The sophisticated, complex and challenging score receives wonderful treatment, performed (thankfully) without the “benefit” of any electronic amplification. David Sikula as the family patriarch is capable and funny, as is Nathan Brown in the dual roles of Joseph Patrick Kennedy (Edie’s one-time fiance) and Jerry, a kind and sympathetic neighborhood delivery boy. Daniel Solomon does well as a loyal household servant. Two very young actresses give stand out performances as the Bouvier children in the first act; Nandi Drayton is Jacqueline Bouvier and Gabriella Jarvie is Lee Bouvier. Nandi Drayton has enough charm and grace to make her believable as the future first lady. Gabriella Jarvie is exceptional, creating the illusion that she is performing each song and dance for the first time and might at any moment get lost, but always coming through with precision. This kind of freshness and vulnerability is unusual and indicates a remarkable degree of talent. 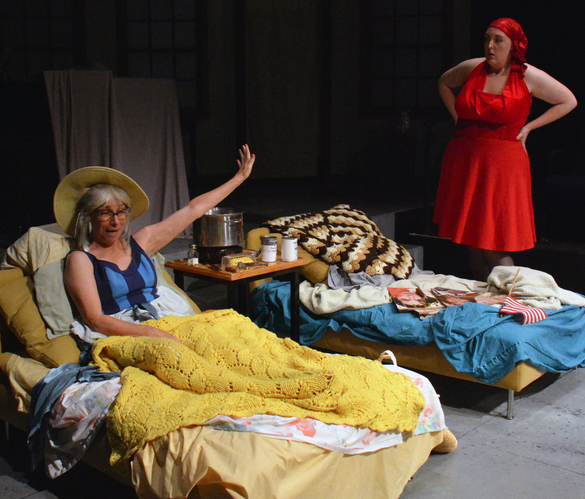 Grey Gardens: The Musical’ plays at the Gough Street Playhouse through June 21. For further information, click here. “Grey Gardens: The Musical” book by Doug Wright, music by Scott Frankel, Lyrics by Michael Korie. Produced by CustomMade Theatre Company. Director: Stuart Bousel. Musical Director: David Brown. Choregorapher: Kim Saunders. Scenic Designer/Technical Director: Stewart Lyle. Costume Design: Brooke Jenings. Lighting Design: William Campbell. Sound Design: Lyz Ryder/Maxx Kurzunski. Edith Bouvier Beale (1941)/”Little” Edie Beale (1973): Heather Orth. Edith Bouvier Beale (1973): Mary Gibboney. “Little” Edie Beale (1941)/Sister Marla: Juliana Lustenader. George Gould Strong: David Arron Brown. Joseph Patrick Kennedy, Jr./Jerry: Nathan Brown. Brooks Sr./Brooks Jr.: David Solomon. Jacqueline “Jackie” Bouvier: Nandi Drayton. Lee Bouvier: Gabriella Jarvie. Posted in Reviews.Tagged Custom Made Theatre Company, Dave Sikula, David Aaron Brown, Edie Bouvier Beale, Gabriella Jarvie, Grey Gardens, Heather Orth, Jacqueline Bouvier Kennedy, Juliana Lustenader, Mary Gibboney, Nadi Drayton, Nathan Brown, Stuart Bousel.